Military psychiatrists used emotionally and psychologically wounded soldiers to experiment with “treatments” like electroshock, insulin shock and mind-altering drugs like LSD. Military psychiatrists used emotionally and psychologically wounded soldiers to experiment with “treatments” like electroshock, insulin shock and mind-altering drugs—much of which would later be considered torture. During this time, the military’s top psychiatrist, Brigadier General William Menninger, would write the manual listing all mental problems he thought soldiers could have—a volume that would ultimately morph into the American Psychiatric Association’s Diagnostic and Statistical Manual of Mental Disorders (DSM). Despite psychiatry’s failed and dangerous results from early military drug testing with LSD, the pharmacological experimentation on unsuspecting troops with mind-altering drugs—never studied or approved for such uses—became a full-frontal attack. Today thirty-seven percent of war veterans are being treated for alleged PTSD, with 80 percent of those being “treated” with at least one psychiatric drug. The overwhelming psychiatric diagnosis fraud of choice assigned to military personnel has become the alleged “mental disorder” Post-Traumatic Stress Disorder (PTSD). Once considered “battle fatigue” and “shell shock,” psychiatrists have subjectively decided soldiers suffering from the horrors of war now are “mentally ill” and suffering from PTSD. With the millions of dollars being spent on getting to the bottom of this “epidemic,” command may find it prudent to take a hard look at some basic facts. Suicides, and other unexplained sudden deaths, have increased for the past several years, as has the diagnosing of PTSD and the prescribing of psychiatric drugs, many of which are not approved by the FDA for treatment of PTSD and many of which cause the very symptoms the troops have sought treatment for. Today thirty-seven percent of war veterans are being treated for the alleged PTSD, with 80 percent of those being “treated” with at least one psychiatric drug. The extent of the increased diagnosing and drugging is reflected in the mental health budgets of the Department of Defense and the Veterans Administration, which collectively have reached nearly $9 billion annually. The Hidden Enemy dramatically reveals the tragic result of psychiatry’s assault on military personnel, providing first-hand accounts from dozens of soldiers who survived the epidemic of pharmacological devastation to tell the tale of overwhelming psycho-pharmacological assault. Not all were so lucky. Since 2002, the U.S. military suicide rates have almost doubled. From 2010 to 2012, more U.S. soldiers died by suicide than from traffic accidents, heart disease, cancer and homicide. In 2012 alone, more U.S. active duty service men and women committed suicide than died in combat, and veterans are killing themselves at the rate of 22 per day. Unbeknownst to the returning warriors prescribed the psychiatrist’s drugs—in some cases more than two-dozen drugs—they may actually be facing a kind of psycho-pharmacological firing squad. From 2005 to 2011, the U.S. Department of Defense increased its prescriptions of psychiatric drugs by nearly seven times. That’s over thirty times faster than civilians. Officially, one in six American service members is on at least one psychiatric drug and over the last ten years, the U.S. government has spent more than $4.5 billion dollars just medicating soldiers and veterans. Kort’s experience with a virtual “cocktail” of psychiatric drugs is becoming the norm in military mental health “treatment.” The problem, as exposed by The Hidden Enemy, is that the majority of psychiatric drug cocktails have never been studied in combination by national drug regulatory agencies. 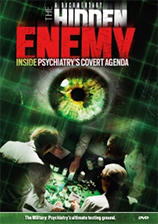 The Hidden Enemy is a comprehensive exposé of psychiatry’s systematic infiltration and control over military forces worldwide, through which the ultimate plan—to slowly bleed into all aspects of civilian life—has now become the reality. Psychiatry’s ugly truth has been laid bare. The Hidden Enemy is a battle cry for action.